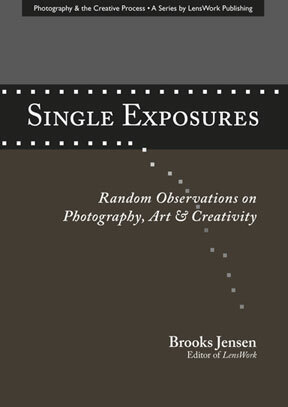 Compiled from the best of the LensWork Commentaries on CD and Brooks’ almost-daily podcast on photography. Ages Of The Photographers; How Protozoans Led Me To Ansel Adams; The Motivation Of A Deadline; Book Remainders At Chapters; Dersu Uzala And The Panorama Format Image; The Medium Is Only The Medium; The More Things Change The More Things Change; The Primary Medium Of Photography; Old Negatives; Who Soups The Prints; Paul Strand, Galileo And The Ellipse; If The Negative Really Is The Score; Gorgeous Fiberbase Gelatin Silver Paper; How The Medium Determines The Answer; Taking Versus Making; The Perfect Photograph; The Gift By Lewis Hyde; Signing Your Prints; Artspeak; Illustrated Letters; Photography Is Not About Light; The Alternative Resource; Separating The World You Work In From The World In Your Photograph; Feedback About Your Work, Part 2; Another Museum In Financial Crisis; Thinking In Sets Of Three; Be Careful What You Ask For, You Might Get It; The Key To The Creative Life; Shareware Photography; Everyone Collects Something; And, Collectible Implies Within Reach; Web Presses, Sheet-Fed Presses And Image Quality In Magazines; Duotone Printing; Goals; The Importance Of White; Ryoanji; Some Things Change, Some Stay The Same; It’s Just What You Get Used To; A Legacy In Our Photographs; Resistance To A Lesson From Tokugawa Japan; Abstracts Don’t Sell; Organization; Being Introduced As A Photographer; Images On The Monitor Or TV Screen — and many, many more! Print version available only from Lulu.com, a print-on-demand, environmentally friendly print alternative to traditional publishing.